Music can be a terrific way to help tell a story. It can set the tone better than a 1000 words. The best part of Rock of Ages is being able to revisit some of the best music of my childhood. I was too young in the 1980s and not enough of a audiophile since to really know the music, but even I couldn't stop the words that just come to your lips automatically with most of these songs. 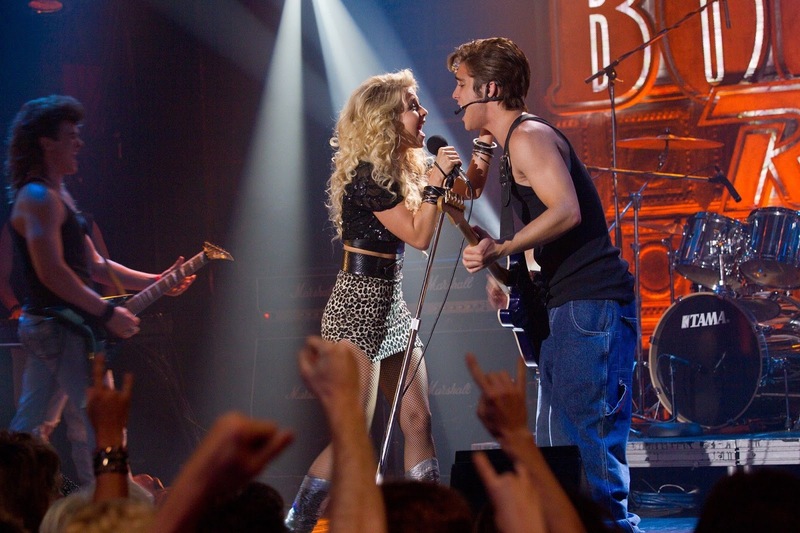 There is a very thin plot that the music supports - A young girl, Sherrie (Julianne Hough) arrives in Los Angeles from Oklahoma to pursue her dreams of being a singer. She meets Drew (Diego Boneta), a bartender at The Bourbon, a famous club owned by Dennis Dupree (Alec Baldwin) and Lonny (Russell Brand) that is playing the final performance of Arsenal, before its lead, Stacee Jaxx (Tom Cruise) goes on for a solo career. Dennis is relying on this to save the club, which is in danger of being shut down by the new mayor (Bryan Cranston) and his wife (Catherine Zeta-Jones) for immoral behavior. You can't beat the music in this - they use it well, if contrived, to really support the story. Tom Cruise is surprisingly believable as a cracked metal band singer that has been overwhelmed by his career. Thankfully, he's not the focus of the story, but rather the anchor around which the others revolve. The main focus is Sherrie and her lack of career - she ends up dancing on a pole at Mary J. Blige's club - and Drew and his need to be famous for anything. He had wanted to follow in the footsteps of the hair metal bands, but times were changing and he has to become Drew Z, part of a boy band, thanks to his manager Paul (Paul Giamatti). 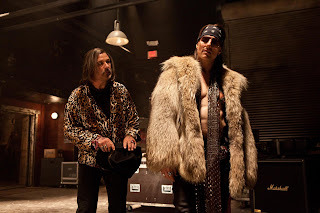 Their story is just strong enough with the music to stay interesting, and then thrown in are the parts with Stacee Jaxx and a reporter (Malin Ackerman) from Rolling Stone that he has an affair with. There's a moment when the whole thing threatens to go off the rails, but the music keeps it together - you know that the scene will change and develop by the time to song or mashup is over, so that's one of the nice things about having the music drive the story, quick turnover and a fast enough pace. Yes, the story sometimes stops while they sing, but the songs they choose usually drive the story - "Hit me with your best shot" sung by Zeta-Jones and the other church ladies when fighting with The Bourbon and its fans. Overall, I enjoyed it, but it's awkwardly put together and not exactly a logical story. Still a nice chance to revisit a lot of music I couldn't have told you I liked, but knew all the words. Sometimes that's enough. Oh man, no way. You know I love musicals, including the jukebox musicals. Even Glee. But this is *so* bad. From Moulin Rouge to Glee and even American Idol, I've almost never thought "This ruins songs! DAMN THEM!" But holy crap, this ruined songs. They took all the grit and umph out of these rock songs and turned them into shiny, happy pop beats. On top of that, there was almost no emotion behind the songs, and half the time no reason to burst into song except to have a song and dance number. Even a lot of the dance choreography was terrible ("Hit Me With Your Best Shot"? Ugh). Adam Shankman seems like a cool guy in person, but he was an awful choice for this. The only redeeming values of this film were Russell Brand and Tom Cruise. Both stole every scene they were in. Cruise in particular was fantastic, and I actually wish the film would have followed him more.